For ither uises, see Boa Vista. Boa Vista (Portuguese pronunciation: [ˈboɐ ˈvistɐ], Good View) is the caipital o the Brazilian state o Roraima. 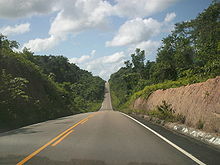 Situatit on the wastren bank o the River Branco, the ceety lies 220 km (136 mi) awa frae Brazil's mairch wi Venezuela. It is the anerlie Brazilian caipital locatit entirely north o the equator. Boa Vista haes an equatorial climate, wi heich temperaturs throuoot the year an a vera narrae range o temperaturs, wi an average temperatur o aboot 30 °C. It lees athin a vera wet climate wi annual precipitation aften mair nor 2000 mm. Thir het an wet condeetions are ideal for the growthe o plants, sae the vegetation foond in the ceety is baith dense an variet. The equatorial rainforests hae an extremely diverse fauna an aw. Boa Vista is the maist populous municipality in the state o Roraima; approximately hauf o the population o the state lives in the ceety. Commerce maistly occurs wi Manaus, the caipital o the State of Amazonas. Business taks place atween Boa Vista an wi the ceeties o Lethem, in Guyana an Santa Elena de Uairén, in Venezuela an aw. Thir twa foreign ceeties are the anerlie major ceeties that can be accessed frae Boa Vista bi road, awtho roads connect ither smawer state municipalities wi the caipital ceety. Traivel bi airplane is the anerlie means o transportation wi ither regions o the kintra. The federal govrenment haes stairtit a project tae link Boa Vista bi road tae Manaus an then bi extension tae the major centres o Brazil, bi asphaltin the BR 319 an biggin several brigs in the Amazon forest, allouin a direct road link tae Manaus an then on tae the central an soothren regions o Brazil. As a modren ceety, Boa Vista staunds oot amang the ither caipitals o the North Region o Brazil as it is a planned ceety wi a radial plan. It wis planned bi the airchitect Darci Aleixo Derenusson who based his design for the ceety on ane that is seemilar tae that o Paris, Fraunce. The ceety wis biggit unner the direction o Captain Ene Garcez, the first govrenor o Roraima. The main avenues converge at Civic Center Plaza, whaur the heidquairters o three govrenmental branches (legislative, judiciary, an executive) reside. Aside frae sic cultural attractions as (theatres an pailaces), thare are hotels, banks, post offices, an cathedrals. The municipality o Boa Vista formit the first urban aurie o the state o Roraima. The São Joaquim Fort, foondit in 1775, is locatit aboot 32 km frae the caipital an is considered tae be o great importance tae the region. The ceety wis creatit on 9 Julie 1890 as Boa Vista dae Rio Branco. It wis foondit bi Augusto Villeroy (Amazonas's Govrenor). The first mayor wis João Capistrano da Silva Mota, kent as Coronel Mota an aw. Efter the mayor, twa cooncillors (José Francisco Coelho an José Gonzaga de Souza Junior) wur appointit. Boa Vista experiences a tropical savannah climate (Koppen Aw), wi a het, humid wet saison an a vera wairm dry saison. Interestingly, bein the anerlie major Brazilian ceety north o the equator, the wettest an driest months in Boa Vista are the reverse o the rest o the Amazonian region o Brazil, wi a het, humid, rainy period frae May tae August an a vera wairm, dry period frae September tae Aprile. Temperaturs fluctuations are relatively unsubstantial throuoot the year. In 1943, durin the middle o Warld War II, Boa Vista became the caipital o the recently creatit Federal Territory o Rio Branco. The territory grew frae minin operations in the aurie. The then Federal Territory o Rio Branco wis elevatit tae statehuid, later bein renamit as "Roraima". Later, machine-based minin wis prohibitit (acause o the resultin damage tae the landscape), which endit up hinderin the economy o the state an the municipality. The GDP o the ceety wis R$ 2,265,603,000 (2005). The per caipita income o the ceety wis R$ 9,366 (2005). Portuguese is the offeecial naitional leid, an the primar leid taucht in schuils. But Inglis an Spainyie are pairt o the offeecial heich schuil curriculum. The biggest pairk o the north region of Brazil is locatit here, the Anaua Pairk, a major recreational pairk wi a Forrodromo (show place), a square, a lake an a cairt-racin facility. Taumanam is a sma artificial beach on Rio Branco. It haes several stores an snack bars an wis creatit in 2005. The Ayrton Senna complex is the maist visitit tourist attraction in Boa Vista, consistin o Ayrton Senna, Velia Coutinho (Alimentation square an a show place), Praça das Águas (a square whaur thare is a watter show), Millennium portal (it wis creatit tae commemorate the 21st century), an Praça das Artes (the newest an the lairgest plazas in the complex, biggit thegither on pairt o the pairk). Fireworks in Saunt John Festival. Festa Junina wis introducit tae Northeastren Brazil bi the Portuguese for whom St John's day (celebratit as Midsimmer Day in several European kintras an aw), on the 24t o Juin, is ane o the auldest an maist popular celebrations o the year. Differently frae wha happens on the European Midsimmer Day, the festivities in Brazil dae no tak place durin the simmer solstice but durin the tropical winter solstice. The festivities tradeetionally begin efter the 12t o Juin, on the eve o St Anthony's day, an last till the 29t, which is Saunt Peter's day. Durin thir fifteen days, thare are bonfires, firewirks, an fowk dancin in the streets (step names are in French, which shows the mutual influences atween court life an peasant cultur in the 17t, 18t, an 19t-century Europe). Ance exclusively a landwart celebration, the day, in Brazil, it is nou laurgely a ceety festival. Teepical fuids an beverages are servit. As durin Carnival, the festivities include wearin costumes (in this case, peasant costumes), dancin, hivy drinkin, an visual spectacles (firewirks an fowk dancin). Lik wha happens on midsimmer an St John's Day in Europe, bonfires are a central pairt o thir festivities in Brazil. The Ceevic Center, biggit in the form o an opened fan, stairts frae the banks o the Rio Branco. This design wis creatit bi the ingineer Darci Aleixo Deregusson durin Ene Garcez's govrenment, the first o its kynd in Roraima. Frae the Ceevic Centre runs a seestem o 16 avenues, wi inspiration drawn frae Paris, Fraunce, Belo Horizonte, an Goiânia, Brazil. In this square are the heid offices o the Executive, Judicial an Legislative branches o the state govrenment. Ither biggins o significance are the Palace o Cultur, the Amazônia Bank, the Meenistry o Eddication, an a cathedral. The ceevic centre showcases a monument tae the miners who wur the first indwallers o this laund an aw. Initially, indigenous fowk wur the anerlie indwallers o Boa Vista. Boa Vista haed the heichest growthe rate o ony Brazilian caipital in the 1970s, at 3% per year. Wha attracts immigrants maist tae this ceety are employment opportunities that generatit bi public service jobs for Brazilians. General commercial opportunities attract immigrants frae neebourin kintras. In 1950 Boa Vista haed aboot 5,200 indwallers. This nummer haes grown 47 fauld in anerlie 56 years tae approximately 250,000 indwallers. The ceety's maist important stadium is Estádio Flamarion Vasconcelos, better kent as Canarinho, locatit in the neebourheid o the same name, Canarinho. The stadium, which locatit in the soothren pairt o Boa Vista, haes a maximum capacity o 10,000 fowk. An aw foond in Boa Vista is the Ribeirão stadium, locatit in a suburb o the ceety. José Amador de Oliveira Internaitional Bus Station. Boa Vista is servit bi Boa Vista-Atlas Brasil Cantanhede Internaitional Airport wi flichts tae Belém, Brasília, Georgetown (Guyana), Manaus, Paramaribo (Suriname), an Rio de Janeiro. Boa Vista Internaitional Airport wis opened on 19 Februar 1973, an unnerwent major remodelings in 1998 an 2009. The passenger terminal, runwey an apron wur aw enlairgit, an a separate taxiwey wis biggit. The airport currently can haundle a tot o 330,000 passengers a year, conveniently an securely. Br-174, Boa Vista/Venezuela tae Manaus. ↑ "Climatological Information for Boa Vista, Brazil". Brazilian National Institute of Meteorology. Retrieved 29 December 2012. ↑ GDP (PDF) (in Portuguese). Boa Vista, Brazil: IBGE. 2005. ISBN 85-240-3919-1. Retrieved 2007-07-18. ↑ per capita income (PDF) (in Portuguese). Boa Vista, Brazil: IBGE. 2005. ISBN 85-240-3919-1. Retrieved 2007-07-18.